Just because we’re used to seeing teenagers all the time with metal braces doesn’t mean it’s the only option for them. So often, people have the misconception that Invisalign was created for adults. However, we all want a straighter smile without a mouth full of metal! We do fit plenty of adults with these inconspicuous trays, but let’s take a moment to talk about Invisalign for teens. Teenagers already have to deal with a lot. We sometimes don’t take their struggles as seriously as we should. But, if we stop and remember what middle school is like: the cliques, the bullying, the changing bodies and confusing adult-but-not-quite-adult situations that have to be navigated for the first time… it’s overwhelming! The more we can offer our teenagers a little bit of grace and comfort during this particularly hard time, the better. Bullying is such an issue these days, and young people who are perceived as different from their peers are often at risk for this type of negative interaction. Sometimes, it can be something as small as braces (or even a pimple or the wrong clothes) that can make someone a target for bullying. Invisalign is a double-whammy. 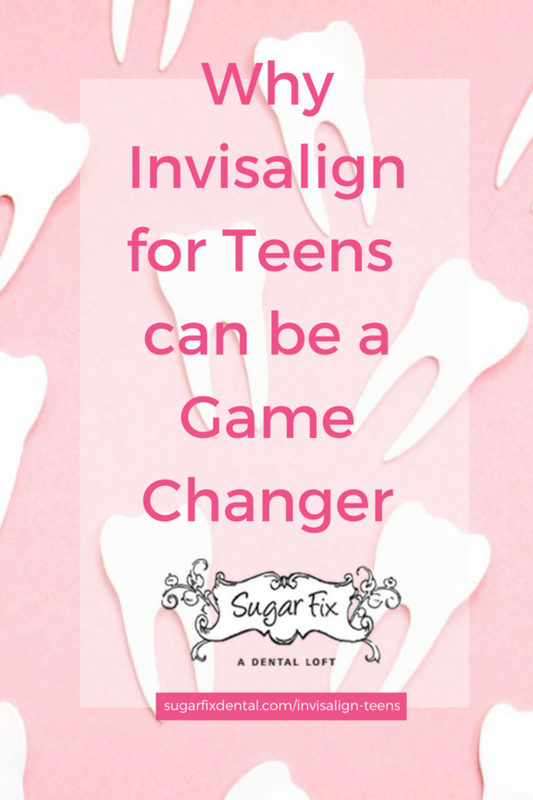 Not only does it correct misaligned teeth that may be causing a confidence issue, it does so inconspicuously, which can also make teenagers feel much more comfortable. Many parents are concerned about the added cost of Invisalign over traditional metal braces. We’re always happy to tell them that Invisalign generally costs about the same as traditional braces. Of course, every case is unique. We’re always happy to provide a complete cost comparison when you come in for your consultation. When you have a busy teenager who’s always on the go, it can be an everyday battle to make sure they’re taking care of their metal braces. You have to make sure they’re staying away from foods on the “no” list. You have to make sure they’re properly brushing and flossing between all of the wires and brackets. With Invisalign, they can eat or drink whatever they want. Then, they brush and floss like they normally would. Easy peasy! Generally, Invisalign works faster than metal braces, too. You’re typically looking at 8-18 months versus 24 months for traditional braces. Invisalign also requires fewer checkups, which saves you money and effort. We know how hard it can be to get a teenager to come in for an appointment! Also, they can keep playing all their favorite sports. With traditional metal braces, teens are asked to avoid rough contact sports. This can be difficult seeing as this is the time in their lives where they’re trying out different extracurricular activities and setting the foundation for high school sports. No matter which way you look at it, Invisalign is a better option for teenagers than traditional metal braces. We feel strongly about it, and we’ve seen it work for many of our patients. Hop on over to our Smile Gallery to see for yourself! If you want to learn more about Invisalign, we’d love to talk to you! Give us a call or fill out our contact form and we’ll answer any questions you may have!